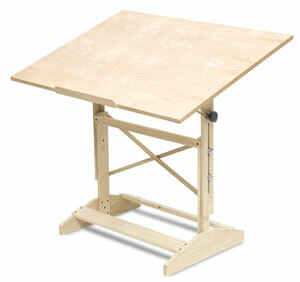 This solid poplar wood drafting table offers sturdy, top-quality construction at an affordable price. What's more, it can be stained or painted to suit any studio or office décor. Adjustable from 31½" to 43" (80 cm to 109 cm) high, it features a ¾" (2 cm) thick wood drawing board that adjusts to any angle, and a pencil ledge. The drafting table ships unassembled with easy-to-follow assembly instructions.